This waistcoat is a rare example of early 17th century informal dress. 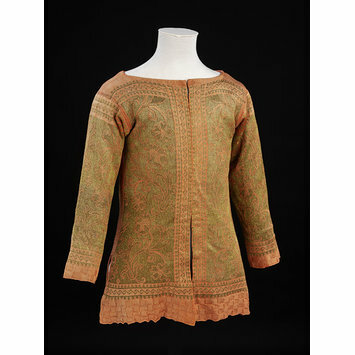 References to these garments in wills and wardrobe accounts show that they were worn by both men and women. The waistcoat is hand knit with coral pink silk and yellow silk wrapped with silver-gilt thread. It is constructed of five shaped panels, one for the back, one each for the two fronts and the sleeves. The seams are hand-sewn with silk thread and the whole garment is lined with blue linen. A series of regular holes along the front edges of the lining on each front edge suggest that it originally fastened with silk ribbons and metal points. It was once thought that these waistcoats were produced on the early versions of the knitting frame. However research has shown that the frame was not developed enough in the early 17th century to produce purl stitches or such a fine gauge. Each panel of knitting bears a pattern of stylised scrolling floral motifs worked in yellow silk on coral. These may have been inspired by the designs of woven silks. A very similar pattern can be seen on knitted waistcoats in the Royal Ontario Museum, the Cleveland Museum of Art and the Museum der Stadt in Ulm. The design is further delineated by the use of reverse stocking stitch against a ground of stocking stitch. A border of basket stitch (squares of purl and stocking stitch) edges the lower hem and wrists. The knitting is very fine, about 17 stitches per inch. A long sleeved waistcoat of coral silk and yellow silk partially wrapped with silver strip, knit in a pattern of stylized scrolling floral motifs. It is made up of shaped panels, one for the back, one for each front and one for each sleeve, with a slit at each side seam and at each wrist. The waistcoat opens down the front; a series of regular holes along the front edges of the lining suggest that it was once fastened silk ribbons and metal points. The waistcoat is worked in stocking stitch and reverse stocking stitch in a gauge of about 17 stitches per inch, with a border of basket stitch at the lower edge and at each wrist. The seams are sewn with silk thread and the whole garment is lined with blue linen. Recent research on the knitting industry in Italy suggests that these waistcoats, particularly those in metal threads and imitating the designs of woven silks, were made in Naples. This is a very informal type of garment worn during the late 16th and early 17th centuries, which never appears in visual images and with few references in inventories and accounts. They seem to have been produced in workshops, knit in ensembles of shaped pieces for the fronts, backs and sleeves. This waistcoat could have been worn by a man or a woman. Silvana Musella Guida, 'La nascita della magliera a Napoli in età moderna/The birth of knitwear in Naples in modern times', Jacquard, vol.71, April 2013, pp.3-32, plate 6a, 6b. These jackets were constructed from separated panels of knitting joined together. The floral patterns in stocking stitch and purl were influenced by contemporary woven silk designs. 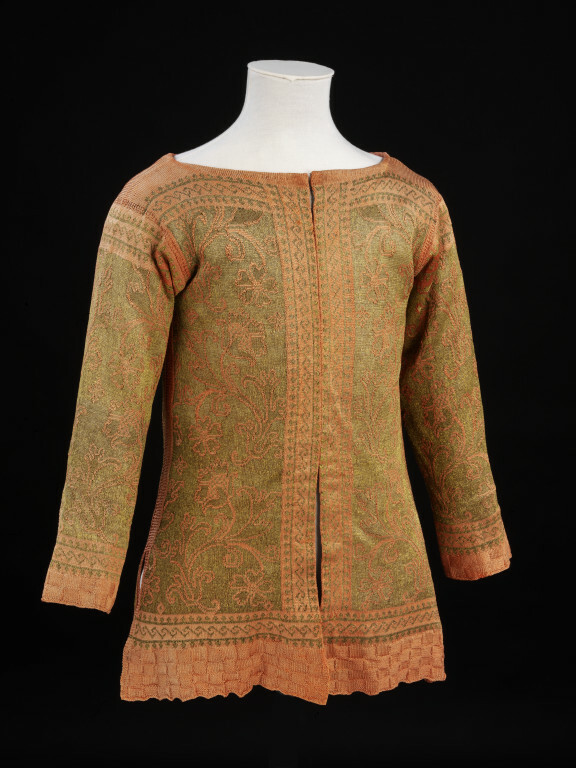 The now faded coral-coloured jacket (back view shown) is lined with blue coarsely-woven linen and has the remains of silk binding at the neck. The other is less well-knitted and finished, has gussets added from another garment and is unlined. There are long floats of yarn on the reverse of the knitting. Similar jackets have survived in many parts of Europe and it is assumed that they came from one centre of production - Italy seems most likely as silk yarns were most easily obtainable there. It is possible that the knitted pieces were stitched together by the purchaser.